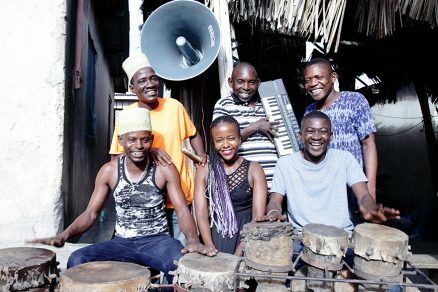 Tanzania’s seven-piece Jagwa Music play nutty grooves at breakneck speed on traditional and makeshift percussion, a keyboard player who goes mad on a battered vintage Casio, breathtaking, spectacular dancers and a charismatic lead vocalist/MC who belts out songs about corruption and deprivation, survival in the urban maze, unfaithful lovers and voodoo. Jagwa Music are the leading exponent of the Mchiriku style, which originated twenty years ago in the rougher parts of Bongo, as the girtty East African city of Dar es Salaam is affectionately nicknamed by locals, when cheap Casio keyboards became available, and drew the attention of bands who were playing Chakacha dance music. The band has floored audiences from Zanzibar to Spain. Jagwa Music is part of Center Stage, a public diplomacy initiative of the U.S. Department of State’s Bureau of Educational and Cultural Affairs, administered by the New England Foundation for the Arts in cooperation with the U.S. Regional Arts Organizations, with support from the Doris Duke Foundation for Islamic Art. General management is provided by Lisa Booth Management, Inc.